The art of gnocchi making will be explained in great detail with tips and pointers along the way to enable you to roll gnocchi like a Nonna at home! 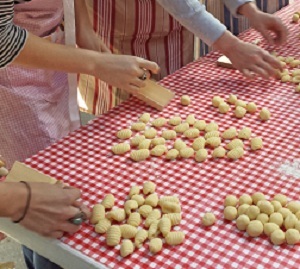 Everyone will get to see how the gnocchi dough is made and then we will all roll up our sleeves and have a go at rolling it by hand (the best way to learn is to do!) this will be followed by a delicious sample of some cooked gnocchi with a napolitana sauce and parmesan cheese. Anelis runs her own business The Lunch Lady, a fresh and healthy mobile lunch delivery service to workplaces in the city. She also has a market stall every Sunday at the Flinders St Market serving all sorts of extraordinary and yummy things to eat. Her background? Anelis is a chef, whose passion for food is borderline ridiculous. Her first food experience was an egg and lettuce sandwich at kindy which she says “blew her mind”. Her food philosophy is simple: she uses the best quality, organic and seasonal produce she can get her hands on, because she believes you can taste the difference. Check her out on Facebook.